Lexi Walker, 11, from Sandy, Utah, has captivated hundreds of thousands this past year with her performances at a Real Salt Lake soccer game, USANA's 2013 International Convention and the "We Are Hope" concert at the Conference Center in Salt Lake City. But her most recent performance with artist Alex Boyé has garnered attention around the world, with video views reaching more than 18 million. "With six kids, we try and keep things normal for everyone by making sure that whatever comes up gets worked around doing things that really matter like family prayer, scripture study, eating together and, of course, laundry, " Lexi's mother, Lisa Walker told the Deseret News. When Lisa first began looking for a recording studio for Lexi a little more than a year ago, it wasn't to help Lexi pursue a solo career but to make her a member of the One Voice Children's Choir, which she now is. "She told me, 'OK, how do I get my daughter in your choir?' And I said 'Why do you want your daughter to join a choir when she can already shine as a soloist all over the place?'" said Masa Fukuda, the director of One Voice Children's Choir. "I’ve worked with so many stage mothers that are all about promoting their daughters, and she said, 'No, no, no. I don’t want my daughter to be a diva." And even with the success of Lexi's solo in Boyé's video, she has remained modest about her performance. "I only saw the video one time right in the beginning before there were very many views, " Lexi told the Deseret News. "It wasn’t until later that I heard it was going a little crazy. I’m really glad that people like it." In addition to humility, the 11-year-old sensation also has an innate love for music. "I have always, always loved to sing, " Lexi said. "It is one of the best ways I know of to express how I’m feeling." Growing up, Lexi never took vocal lessons, but she was always surrounded by music. "Her Grandma Walker taught music in public school for 30 years and is quite renowned as a vocal teacher, " Lisa Walker said. "Whenever Grandma was over or the kids would visit her, there was music that focused on breathing correctly, placement, etc. Music has just always been a part of our lives." It wasn't until six months ago that Lexi began to work with her professional vocal coach, Tricia Swanson, who was amazed by Lexi's natural ability. "She’s such a talented girl. She just came to me singing with this big beautiful voice. I’m like, ‘Holy cow. You’re only 11?’" Swanson said. "When I first heard her, I knew right away that she had this incredible talent. It’s a God-given talent. She was born with it." Although she has only been working with Lexi for a short time, Swanson says the opportunity is an honor. "I really enjoy teaching her because she has so much energy, and she’s so smart and catches on to pretty much everything that I teach her. She’s really just an amazing little girl, " Swanson said. Fukuda, the One Voice Children's Choir director, has also been impressed by Lexi's current talent and as well as her dreams for the future. "She has so many aspirations, " Fukuda said. "I asked her what she wants to be and she said, ‘I want to be a scientist, ’ and I’m like you’ve got to be kidding me. After all the dancing and singing and modeling and acting and everything she’s good at, she wants to be a scientist. Of course that could change still, but she’s just a regular girl." Swanson pointed out that the way Lexi has been raised has had a positive influence on her perspective. "She’s a humble little girl, " Swanson said. "Her parents are humble people. They keep her grounded, and I’m very impressed by that." That's why when Swanson first heard about the "Let It Go" music video, she warned Lisa that the video would most likely take off because of the song itself and the talent involved. Lexi became involved in the production months after first meeting Boyé in May of 2013 through Boyé's connections with Fukuda. "We finally decided to do a video together, and I said to Alex, 'You’ve got to take a listen to this girl. She’s a little Beyoncé, but more, and I think you will enjoy getting to know her, '" Fukuda said. For Lexi, it was an exciting opportunity to sing one of her favorite songs and get into character. "That is one of the best songs from one of the best movies ever, " Lexi said. "I loved filming it, but one of my favorite parts was actually getting ready for it. It took about two hours to get dressed, do the hair and finish up with the makeup." 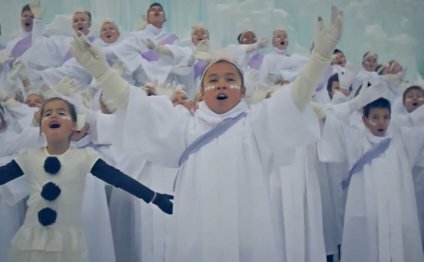 And even though filming at the Ice Castles in Midway, Utah, took place on a day with a high of only 12 degrees, all of the children involved refused to miss a chance to participate. "I knew it would hit 1 million, and this is what I told the kids: 'I want you to take this very seriously.' We had to learn the song in one week, we had to get the film done in one week, but I said, 'It’s worth it, and I’m telling you my projection is that it will hit a million in two or three months, '" Fukuda said. "I did not think we’d hit a million in the first day and 18 million in 10 days. It’s exceeded far beyond my projection." As for Lisa Walker, she has enjoyed seeing her daughter blossom as opportunities come their way. "We always knew she could sing, but it wasn’t really until we watched her sing our national anthem at the Real game in front of a stadium full of people that we caught a glimpse of what she was capable of, " Lisa said. "It has been a tremendous experience for us to share in."